Carne é um troço gostoso de comer, mas é obtida de um jeito cruel, vergonhoso, triste. Carne faz parte da cultura da gente, remete à infância, ao lar! Só que matar um ser inocente, só para satisfazer um prazer é desumano. 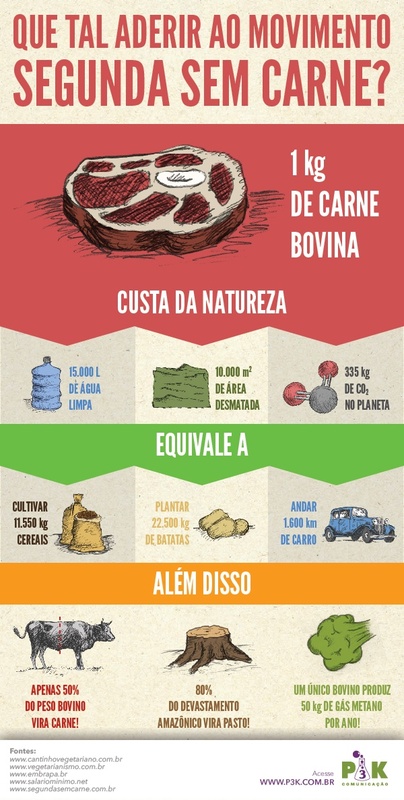 E tem mais, a produção da carne de vaca, principalmente, é muito prejudicial ao meio ambiente! As vaquinhas emitem gases que poluem mais que os carros e os incêndios. Sem contar na derrubada de árvores para fazer pastagens, na quantidade de água que se utiliza. E se for pensar em nutrição, não é legal mesmo! Carne vermelha é super difícil de digerir (isso não precisa ser gênio para descobrir), e a vaquinha que você come não necessariamente se alimenta de matinho. Come sal, come ração, toma vacina pesada! E também não é essencial à vida comer carne, isso já foi comprovado por um zilhão de estudos e por um batalhão de vegetariano que tá aí, vivinho da silva! Então o que fazer? Viver nessa dúvida, comendo com culpa? Não, né, gente! O que se faz é reduzir, reduzir até acabar de vez! Cortar de uma vez um hábito é complicado, doloroso. Mas ir cortando aos pouquinhos é salutar! O seu impacto diminui, sua saúde melhora! Melhora mesmo! Não é inteiramente certo esse papinho que a proteína da carne é essencial para a sobrevivência humana! Duvida? Então leia isso aqui. E isso aqui também, já que não acredita em mim! Mas mesmo assim, você vai encontrar um monte de argumento contra retirar a carne inteiramente do seu cardápio. Então que tal ser vegetariano meio-período? Fonte: Folha de S Paulo. Não peço que você vire vegetariano. Que corte de vez a carne (especialmente a carne bovina) da sua vida. Só peço que por um dia na semana você não coma nenhum produto animal. Faça isso por você, pelos animais e pelo meio ambiente. Vale a pena tentar! Meat is delicious, but it is obtained by way of cruel, shameful, sad behavior. Meat is part of our culture, it takes us back to our childhood! Killing an innocent being, only to meet a tasty pleasure is inhumane. 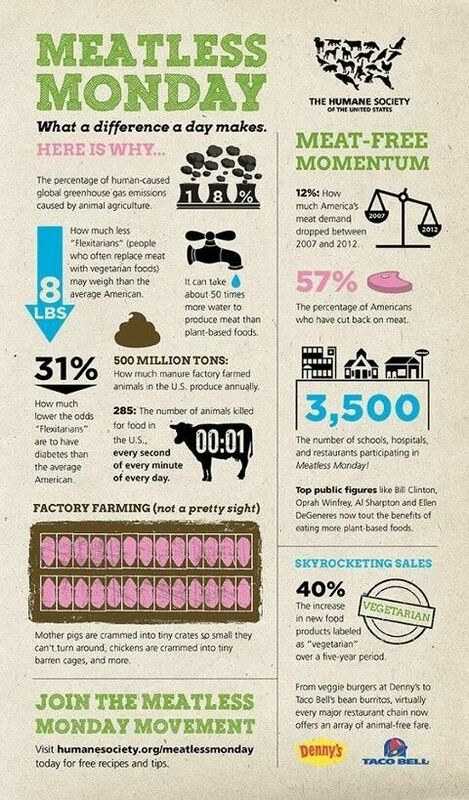 What’s more, the production of beef, primarily, is very harmful to the environment! Cows emit gases that pollute more than cars and forest fires. Not counting the downing of trees to make pasture, the amount of water that you use to raise cattle. And if you think about nutrition, it ‘s not cool! Red meat is super hard to digest (it does not take a genius to figure that one out), and you are not eating the meat of cows that necessarily got fed on healthy green grass. They eat salt, eat processed feeds, take tons of vaccines! And humans don’t necessarily need to eat meat to survive. A zillion studies have been conducted about that and there’s millions of vegetarians around the world, walking around alive and well! So what to do? Live in doubt? Eat with guilt? No, people! What we all should do is reduce, reduce until we are ready to be done with meat! Quitting all at once is complicated, painful. But quitting little by little is easier! Even better: your impact decreases, your health improves! Okay, so you’re not entirely sure you can survive without meat? Read some arguments! Try this here, and this here. There’s all kinds of opinions on the web, mine is only another one. And mine is all about being a part-time vegetarian. Can I tell you my story? When I lived in the U.S., and in Cuiaba, my hometown, eating meat was pretty normal in my life. I would rarely eat fish. But after I moved to Florianópolis, people here live differently. So I began to appreciate a little fish, seafood, even more chicken dishes. And life was getting lighter, more natural and there was really no place for red meat all the time. I haven’t been to a steak house for at least three years. The last time I went, I was sick for two days. Simply not worth it anymore. After I did the ayurveda detox, eating meat has been very complicated. I’ve tried , gently, but it just won’t work for me anymore. It is just bad for me, and I know it leads to a slow digestion, getting fat and unhealthy when it is so hard to achieve balance in my body! So, listen to my proposal. I am not asking you to become a vegetarian. Or asking you to cut meat (especially beef ) out of your life. I only ask you to be aware of your eating habits and their consequence. Be aware. And try to, once a week, MAYBE MONDAYS, not eat any animal products. Do it for you, for the animals and for the environment. It is worth a try! I started with Meatless Monday and now I eat meat only once a week… it works!